Suppose Mr. Dreiser could forget the griefs he must have suffered by the banks of the Wabash far away, and that he lost this beautiful pity which, according to Mr. Mencken, redeems the worst style that has flourished since Laura Jean Libbey and a general literary incompetence – only the beautiful pity is to be attributed to Mr. Mencken. Mr. Dreiser would then stand forth in all his nakedness of culture and of the simplest amenities of life and of literature. If a painter were so ignorant of his craft, it is not very likely that even the most Crocean critic would think that the most divine pity would excuse absurd draughtsmanship, no perspective and miserable brushwork. But novels, being unfortunately written in something like the prose that we all speak, however unwittingly, are an easy prey to the uneducated and the charlatan. He moved, a pathmaker, with heavy crunching powerful steps through the brambles and thickets of American literary prejudice, making way for a host of more graceful but less powerful writers. Not the incurable awkwardness of his style nor his occasional merciless verbosity nor his too frequent interposition of crude argument can destroy the effect which he produces at his best – that of an eminent spirit brooding over the world which in spite of many condemnations he deeply, somberly loves. To me he is a very large and commanding figure in American letters. While some of us have been building chicken coops, or, possibly, bungalows, Mr. Dreiser has been erecting skyscrapers. He makes the three-decker novel look like a pamphlet. In his drawing of characters from the lower strata of life and from the gilded haunts of Broadway, Mr. Dreiser shows an easy competence. … But when the author passes to the doings of conventional society, … he displays a ludicrous ignorance and awkwardness. Dreiser simply does not know how to write, never did know, never wanted to know. Dreiser’s style is of a piece with his general want of concern for imaginative writing as such. As wholes his books are of extreme interest because of the large spirit, the passionate intelligence, which informs them. 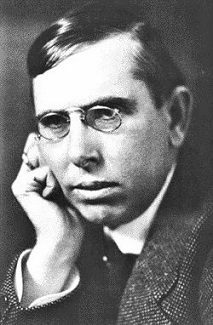 I owe more, perhaps, to Theodore Dreiser than any other man; for he had made me see clearly and vividly the chaotic industrial forces in American life and their devastating effects upon human character. Dreiser writes bunglingly and poorly. His style is groping, clumsy and crude, and sometimes even outrageous. He has no sense of form, and he constantly piles up irritating and useless detail. But who can forget the charming Jennie Gerhardt? Or the brutal and ruthless Cowperwood? Or the poor, pathetic Hurstwood? Or even the will-less and flabby Clyde Griffiths? No one, who has thoroughly read Dreiser. He has an almost miraculous grip on his characters. No other American writer, except the late Ring Lardner, has had such an extensive gallery of convincing characters. And while Lardner was a merciless satirist, without the slightest trace of pity, Dreiser has almost divine pity for the helpless creatures that he has so skillfully drawn. Although Lardner masked his savage contempt for men with a lusty humor, Dreiser totally lacks humor. And Dreiser broods incessantly on the traffic fate of his characters and the profound mystery of life: a kind of intellectual day-dreaming that probably accounts for the sluggish incoherence of his novels. The stark realism of Dreiser is shocking, convincing but disillusioning. And most novel readers seek, not disillusion, but illusion, and thus, they find Dreiser irritating and painful. But compared to the trashy concoctions of Kathleen Norris and Faith Baldwin, although both of them write about the same type of people, he is, indeed, a sincere and conscientious genius. The essential tragedy of Dreiser’s characters is not that they rebelled against the established order, but that they accepted too naively its prejudices, its superstitions, its ideals. This is almost an obsession with Dreiser, who hates the sheer hypocrisy and tawdry pretenses of our social life. He clearly sees the cruel, ruthless forces that ripple and roar beneath our papier-mache formality; and he is fascinated with the vitality men display in trying to combat these tricky forces, although they may be defeated in the end. Dreiser was in turn pathetic and lovable, sublime and ludicrous. He had within him that chaos which gives birth to dancing stars. He was one of the authentic geniuses American literature has produced. Dreiser was a thinker and a thinker moreover with a living growing philosophy of life, that had he lived to be a hundred would have remained incomplete and unfinished. And this is the case because his philosophy was the expression of his personality and his personality never ceased developing. Dreiser’s head is an arduous, monumental head, geological in character, a head of the afflicted Prometheus bound to the Caucasus, and which, across the inexorable centuries, has become ingrained with the Caucasus and now has a fundamental component of rock that is pained by life. Dreiser’s work is no different from his tragic face: it is as torpid as the mountains or the deserts, but like them it is important an elemental and inarticulate way. He cannot be dismissed as a confused genius; he cannot be dismissed as a foggy giant; he cannot be dismissed as a man who, despite a sophomoric philosophy wrote great novels. Dreiser’s contempt for the numskull mass is in most of his philosophy. His pretension to moral superiority shows in his cries of “Hell!”, in his cool, erudite, false humility, in his terse omniscience, in his garbled, gaudy symbolism. Dreiser was always “serious: the critics made him a “philosopher.” What they recognized as breadth in his novels was made “passionate intelligence.” … I think the key to Dreiser’s philosophical writing is pretentiousness, a pose of intellectual superiority. … Dreiser’s yearning for the high class led him to his incredible intellectual pretensions. Assuming as self-evident his stupidity and ignorance, we are appalled by the picture of a foggy giant, struggling to be “smart,” writing volume after volume of trash, corrupting his great gifts. … Dreiser wanted to write about the rich; he had a pitiful need to appear familiar with the “great world.” But he was not familiar with it. And when he wrote about it, he wrote about the surface qualities of it, never once touching the refinement, the sense of superior knowledge and awareness through ease. Dreiser was a snob on one level, a man with exorbitant class yearnings, a man who resented his origins and was scornful of the lower classes. … Dreiser’s vision was clouded many times by this snobbery. It led to certain cruelties and flippancies and certain absurd superficialities. It drove him to portray the rich with absurd, unreal strokes. It drove him in his non-fiction to tolerance of poverty and ugliness as the secret complement to thought and beauty. It drove his to attempt a portrait of himself to the reader as a knowing, superior being. … Through his work rages his own private battle between hate and resentment of the upper class and abject admiration and envy, and an attempt to identify with them. Whenever class consciousness touches his writing, the effect is false. Whenever he attempts to identity with knowingness or annihilate with scorn, he is unrealistic. Whenever he sees his character as apart from his social yearnings, as united to him, not in education and money, but in love, hate, hunger, fear, he is realistic. Dreiser is a forgotten man, almost, but if you go back you can see what he was trying to do with the novel. He didn’t succeed because I think he imposed his own limitations. How many exsanguinous grammarians are prepared to announce that Dreiser was a clumsy poser? How easy it is to diminish him, but where is the man who could write “Sister Carrie” and “Jennie Gerhardt”? His mind, it often seemed to us, was like an attic in an earthquake, full of big trunks that slithered about and popped open one after another, so that he spoke sometimes as a Social Darwinist, sometimes as a Marxist, sometimes almost as a fascist, and sometimes as a sentimental reformer. Time was when there was magic in the name Theodore Dreiser. Some sense of that old magic remains with me today. Everything that can be said against Theodore Dreiser has been said. It is therefore time to make the case for him in terms that finally matter – that is to say, as a writer, a writer who did much that was new in writing. The case against Dreiser much resembles Samuel Johnson’s case against John Milton. Dreiser was a disagreeable man. His sexual conduct was outrageous, and his political opinions equally so. As Johnson would think of Milton, Dreiser’s philosophical opinions, if philosophical is the right word, were incoherent. His style occasionally is embarrassing to the revolutionary cause. Trilling in his otherwise great essay does not address Dreiser specifically as a novelist, does not locate his actual power, the power that makes us emotionally exhausted by the fate of Carrie or Clyde. It is the best of Dreiser that matters, not his foolishness, and it is the best that will endure. When Dreiser is telling the truth about the beauty and the possibility of the city, he writes in a direct and muscular prose, a prose that expresses the city and what it offers. It remains a fact that the defendant, Theodore Dreiser, accomplished something new in our literature, perhaps accomplished it despite his moralistic predispositions. He wrote about the aesthetic possibilities of the American city with a power that no one had done before. H. L. Mencken wrote in 1917, “Dreiser stands up-a phenomenon unescapably visible, but disconcertingly hard to explain.” He still does, and he still is. Since his time we have had Fitzgerald and Hemingway and Faulkner, Cather and Steinbeck and Mailer, Styron and Bellow and Updike; but Dreiser stands up across the years as the man who almost single-handedly brought American fiction out of the l9th Century’s “genteel tradition” into 20th Century literature. What makes Dreiser so disconcertingly hard to explain is the fact that he did this with a body of work hardly calculated to bring about such a result. His novels are excruciatingly long, clumsily written, with endless stretches of tedium and scarcely a single redeeming touch of lightness or humor. The so-called “philosophical” works, on which he set such store, are a hodgepodge of bad thinking and worse writing. He gave years of his life to campaigning for a variety of political and social causes, some of which were in direct contradiction to others, and all of which kept him away from his true vocation. These things, and much else besides, lay within the man himself. There were other forces at work, extraneous to Dreiser, that made it extraordinarily difficult for him to achieve his ends. It seems safe to say that no other American writer has suffered to quite the same degree from critical misunderstanding or assaults by guardians of the national morality. Theodore Dreiser’s acknowledged “greatness” isn’t easy to pin down or to separate from his notorious lapses as a writer and thinker. Like Walt Whitman, another shaggy outsider, Dreiser elbowed himself into the company of Leading American Authors without the proper credentials. There are still those who think that he does not belong in the club. Dreiser wasn’t an original thinker or a profound social analyst, and he certainly wasn’t the first writer to dramatize the “tragedy of desire,” the bleak indifference of nature, or the nightmare of the American dream. He was a deep feeler, however, and he was embedded as no other writer before him in the amorphous and heterogeneous American commonality. He was of it as his alter egos Carrie Meeber, George Hurstwood, Eugene Witla, and Clyde Griffiths were of it. Many other realists have also built on stable structures, but Dreiser was uniquely able to convey instability as well. Formlessness fascinated this master of form and runs like a lyric countermelody through his writing. … By blending form and fluidity with nearly invisible skill, Dreiser rounded off the rough edges of his structures, made them flexible. … By allowing both will and accident, both eros and convention, to shape his work, Dreiser achieved the fumbling give-and-take that is the hallmark of his realism and, like an architect who plans for earthquake, did much to ensure long life for his creations. How did Dreiser paint his pictures and build his structures? By writing superb English prose. … Dreiser wrote badly? An awkward sentence here and there, perhaps; Dreiser might have nodded, along with Homer. Much more striking is page after page of durable English in the plainspoken tradition of the King James Bible and Daniel Defoe, simple words in supple sentences. Dreiser and Norris are in crucial ways simply embarrassing. Dreiser’s sloppiness as a writer and sentimentality as a thinker and Norris’s crude biases and philosophizing disqualify them for inclusion in the great white male writers’ tradition, even if only because they expose too nakedly certain attitudes and values more subtly veiled in the work of their artistic superiors. Theodore Dreiser was and is the great grizzly bear of American literature – wild and coarse and powerful, definitely commanding respect, if grudgingly. Smooth prose composition eluded him forever. His style was raw, his sentences often bewildering, and he organized poorly. Dreiser’s major novels are structurally chaotic, causing one to wonder if he outlined his material before commencing a project. To summarize his plots is to enumerate banalities. More than 100 years ago Dreiser understood exactly what the rootlessness and superficiality of the modern world would do to our souls, and in ‘Sister Carrie’ he presents it all unflinchingly. Critics say Dreiser is a terrible prose writer. Maybe so. But he’s a great storyteller. Dreiser was the biggest literary cudgel that Mencken could wield in his prime against American Puritanism. … In the cold light of day nearly a century after the Dreiser Wars, you could even argue that ‘Theodore Dreiser, novelist,’ has become a literary subcategory of ‘H.L. Mencken, critic’ in the great procession of American letters. There’s something moving about the sheer strength of Dreiser. He’s overwhelming. Dreiser exults in the energy of cities like Cleveland and Chicago, but depicts them as grinding down the wills of weak characters and strengthening the ruthless; Dreiser may create hidden refuges of pastoral delight within the heart of this urban wasteland, but the pastoral is squeezed into insignificance by the city’s irrepressible growth. To read Dreiser is to become aware of a flat declamatory tone apparently unconcerned with niceties of style. He has been described as the kind of writer who triumphs over his own deficiencies of style, and as a writer who rummages through his characters’ thoughts with the impatient thoroughness of a child left alone to explore the contents of an attic. [His] tales of the rise and fall of ordinary people in the Gilded Age retained their power despite slovenly diction, bad grammar, and the author’s penchant for surges of bombastic prose-poetry. Dreiser was incapable of really, truly loving another person in his adulthood and never did (cf. Harry Stack Sullivan’s oft quoted definition of absolute love). A corollary was that he could never freely accept love or kindness nor trust anyone’s good intentions towards him. It has occurred to me that Dreiser was incapable of self-censorship. He was completely sincere and not at all concerned, it would seem, with what others might or would think about the things he revealed about himself. It was as if he were incapable of being embarrassed. Perhaps this had something to do with circumstances of his upbringing. His sincerity is one of his most appealing traits as a writer, I believe. His frankness is notable, in an era where topics were handled so much more gingerly than now. This entry was posted in appraisals by non-critics, Dreiser's style, miscellaneous and tagged Arnold Bennett, シオドア・ドライサー, シオドア・ドライザー, シオドー・ドライサー, シオドー・ドライザー, セオドア・ドライサー, セオドア・ドライザー, Bev Hogue, Burton Rascoe, Carl Van Doren, Charles A. Fecher, Daniel Aaron, Dorothy Parker, Edward Dahlberg, Elizabeth Ammons, Geoffrey O'Brien, George Ade, H. L. Mencken, Harper Lee, James Fallows, James T. Farrell, Jeffrey Hart, Joan Didion, John Cowper Powys, Jorge Luis Borges, Joseph Warren Beach, Larry Sindwell, Malcolm Cowley, Mary Ann Gwinn, Michael Lydon, теодор драйзер, Paul Elmer More, Robert H. Elias, Roger Smith, Roger W. Smith, Scott MLemee, Theodore Dreiser, Thomas Kranidas on May 8, 2018 by Roger W. Smith. The American Spectator was a monthly literary magazine which made its first monthly appearance in November 1932. It was edited by George Jean Nathan, though Eugene O’Neill, Ernest Boyd, Theodore Dreiser, and James Branch Cabell were also listed as joint editors. The original editors left the publication in 1935, after which the paper continued monthly publication under new editors until October 1936. The American Spectator lasted another six months on a bimonthly before folding altogether. This entry was posted in interviews with Dreiser, miscellaneous and tagged シオドア・ドライサー, シオドア・ドライザー, シオドー・ドライサー, シオドー・ドライザー, セオドア・ドライサー, セオドア・ドライザー, Ernest Boyd, George Jean Nathan, James Branch Cabell, теодор драйзер, The American Spectator (literary magazine), Theodore Dreiser on May 2, 2018 by Roger W. Smith.